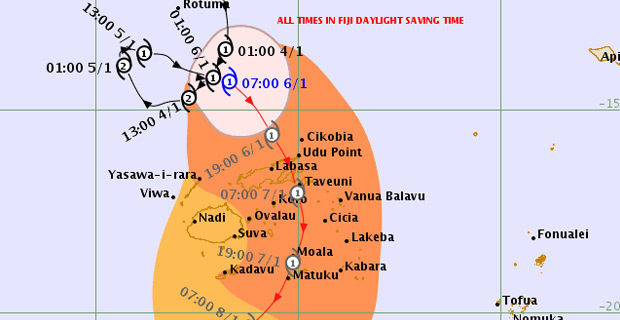 Category one Tropical Cyclone Mona continues to track towards Fiji moving east-southeast at about 16km/hr. Cyclone Mona was located at about 260km North-Northwest of Labasa or about 280km North-Northeast of Yasawa-i-rara at 7 o’clock this morning. Nadi Weather Office Senior Forecaster Amit Singh says based on the projections the centre of Cyclone Mona is expected to pass between Labasa and Udu Point. Singh says that the expected time for the centre to pass over Vanua Levu is later this afternoon adding that this may also be subject to change. 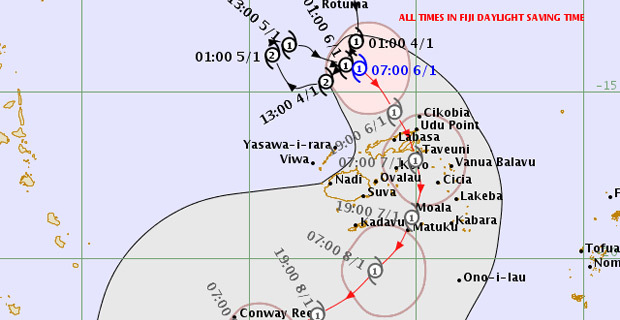 He adds that based on the uncertainty of the track, some of the guidance is showing that Cyclone Mona could track further south and the center could pass further east of Viti Levu. Damaging gale force winds are likely to begin several hours before the cyclone centre passes overhead or nearby. On the forecast track the centre is expected to be located about 230km East-Northeast of Yasawa-i-rara or about 100km North of Labasa at 7 tonight.